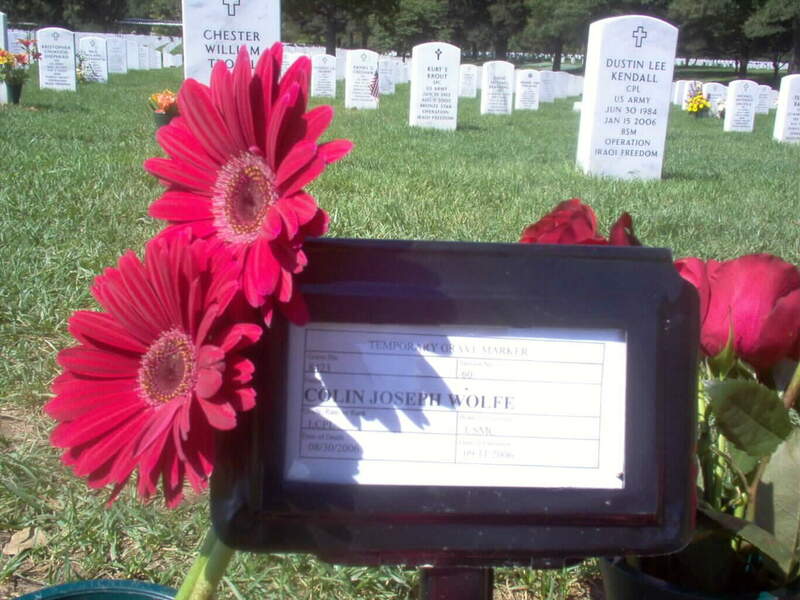 Private First Class Colin J. Wolfe, 18, of Manassas, Virginia, died August 30, 2006, while conducting combat operations in Al Anbar province, Iraq. He was assigned to 3rd Battalion, 2nd Marine Regiment, 2nd Marine Division, II Marine Expeditionary Force, Camp Lejeune, North Carolina. Colin Joseph Wolfe, a dancer turned Marine who fought in Iraq for a mere seven weeks, died Wednesday from an explosion next to his military vehicle, his family said. Wolfe graduated from Osbourn High School and believed very much in becoming a Marine and fighting in Iraq, his parents said. "He loved his country. He wanted to help fight in Iraq to help other people in the world have what we have here," said Amy Wolfe. Colin Wolfe wanted to join the service ever since Marines visited his elementary school classroom, Amy Wolfe said. Growing up, he played baseball and danced for the family-owned Manassas Dance Company. In 2005 Colin Wolfe signed up for the Marines, began training at Parris Island in South Carolina then prepared for his Iraq duty at Camp Lejeune, said his father, Mark Wolfe. "He died doing what he wanted to do," he said. 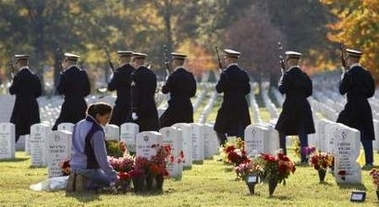 They plan to bury their eldest child and only son in Arlington National Cemetery. "For the congregation, everyone was in absolute shock," said Rabbi Jennifer Wiener of Congregation Ner Shalom. Wiener said the 19-year-old Wolfe was a spiritual person. "He had an inner sense of who he was and his Judaism and God were definitely a part of that," she said. "He wore his uniform to services and he was very respected for what he was doing." She said his time in the Marines brought out his inner strength. "He was too young. He died too young," she said. Amy Wolfe said her son called from Iraq to tell her about his nearly seven-week stint in the Middle East. "It was very, very hard because it's very hot," she said. "They wear pounds and pounds of protective gear. They drive back and forth every day and it's slow and tedious but he felt what he was doing was very important." Rabbi Jonathon Katz, who blessed Wolfe at his bar mitzvah, the Jewish coming of age ceremony, said the teen was a "playful generously spirited good kid." Katz left the congregation after 10 years of service and now practices in Indiana. "I was impressed by the bravery he showed in defending our country in a place so far away," Katz said. "I'm sure he was a fine soldier as he was a fine young man." Amy Wolfe said the family is going to establish a memorial fund in her son's name to support the future performing arts center at the George Mason University Prince William County campus. 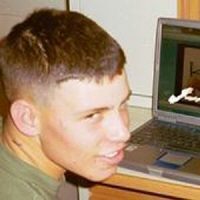 Marine Private First Class Colin Joseph Wolfe of Manassas died last Wednesday, August 30, 2006, in the al-Anbar province of Iraq, while riding in the back of a truck that triggered a road-side bomb. The 19-year-old was assigned to 3rd Battalion, 2nd Marine Regiment, 2nd Marine Division, II Marine Expeditionary Force from Camp Lejeune, North Carolina. A 2005 graduate of Osbourn High School, Wolfe entered the Marine Corps the July after his high school graduation, according to Marine First Lieutenant Barry Edwards. He began basic training and joined the Marine unit that would ultimately be shipped out to Iraq in January 2006. After three months of boot camp and one month of combat training, his unit was deployed to Iraq in July this year. As an assaultman in Iraq, Wolfe's job was to provide anti-armor and anti-bunker support for a squad, platoon or company, according to Edwards. 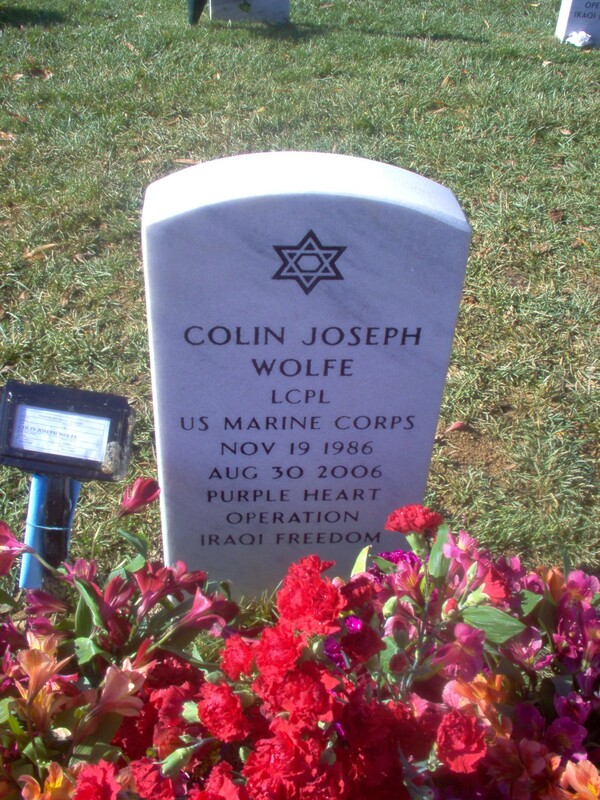 Wolfe would have been in Iraq until at least February. His unit still remains in al-Anbar. Wolfe received three medals for his service: the Iraqi Campaign medal for serving at least 30 days in the Iraqi theater, the Global War on Terrorism service medal for being in a combat-ready unit that could deploy at any time, and the National Defense service medal for "defense of our nation," according to Edwards. His body was returned to the United States on Tuesday. He will be buried at Arlington National Cemetery. According to Wolfe's Myspace page on the Internet, he loved his girlfriend, the Marine Corps and "keeping the family safe." He listened to alternative and hard rock bands such as 311, Sublime, Dropkick Murphys, Rage Against the Machine and enjoyed military movies like "Patton," "Saving Private Ryan" and "Full Metal Jacket." The teen cited Thomas Jefferson, General George Patton, Abraham Lincoln, Robert E. Lee and his father, Mark Wolfe, as his heroes. To many of his friends though, he was the hero. "Colin ... I know (you're) not going to check this but I just heard about what happened this morning, and I am going to miss you," one friend commented on his page on August 31, 2006, the day after his death. "And I am so sorry I never came to visit and (I'm) so proud of you." Another friend thanked him for "the good memories" while yet another expressed gratitude for the young Marine's military service, saying, "Thanks for defending (our) country and again (I'm) going to miss you." One friend talked about the type of friend Colin was to those he knew in high school. "Colin was one of the more joyful parts of my high school career. Every time at lunch he'd come up with something to say to make someone laugh. He would hang out with the best of (them) whether there were 10 kids or 100." On Aug. 6, he told his girlfriend, through her online journal, that he missed her and wanted her to "remember that the clock never stops ticking and that (I'll) be back holding you sooner rather than later." She wrote that she had promised to see him when he returned from Iraq, and added, "Some day, in some way, I will see your smile again." His parents, Mark and Amy Wolfe, own the Manassas Dance Company. He is also survived by his younger sister, CeCe. The Wolfe family is creating a memorial fund for Colin at the George Mason Performing Arts Center, which is under construction on the 234 Bypass. Colin Wolfe was in sixth grade, fixated on girls, sports and the challenges of being a preteen, when a group of Marines visited his Manassas elementary school. He returned to his Manassas home that afternoon with their presentation swimming in his head. Perhaps, he told his parents, he might enlist one day. Wolfe, 19, of Manassas was killed by a roadside bomb in Iraq. Hundreds of mourners attended his funeral. It was just childhood talk, his parents reasoned. Their son was a skilled ballet dancer, performing since childhood with a local dance company, and he had smarts. Perhaps he would go to college. Then came September. 11, 2001. Wolfe was 14 when the twin towers fell, and like so many, he watched in horror as the Pentagon burned on cable news channels. He was just a boy, but the call to action that he felt struck deep. In the years that followed, he collected articles depicting the attacks and search for Osama bin Laden. He talked with friends and family about the war on terror and visited the Pentagon and Ground Zero in New York. And when he graduated from Osbourn High School in Manassas last year, he did the one thing he felt in his heart that was right: He enlisted in the Marines, ready to fight. "Like a lot of kids, he had a sense of wanting to serve his country, but 9/11 crystallized that in him," said Mark Wolfe, his father. Private First Class Colin J. Wolfe, 19, was deployed to Iraq in July. He was killed August 30, 2006, in Anbar province, when the Humvee in which he was riding struck a roadside bomb. 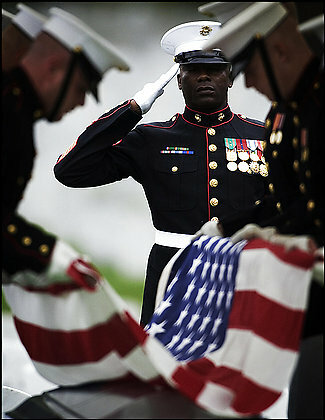 Yesterday, family and friends gathered at Arlington National Cemetery to honor the slain Marine. His parents picked September 11, 2006, for the burial, believing it to be a fitting tribute to a young man who gave his life for his country in Iraq. "He knew what he was fighting for and what he was all about," Mark Wolfe said. "He believed he was serving the country, protecting the country. He had made his choice." 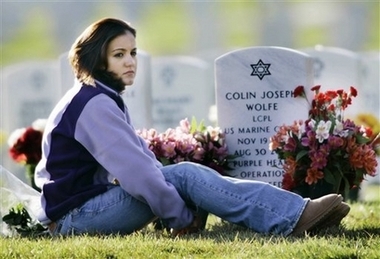 she mourns at the grave of her boyfriend Colin Wolfe of Manassas, Virginia, at Arlington Cemetery November 3, 2006. It is but one white crest in a sea of thousands, but Kira knows Colin's grave like home. She comes to it in the morning, before the air fills with the sounds of idling tour buses and rifle salutes. She comes bearing gifts, an armful of fresh flowers or some plastic ones when it's cold. 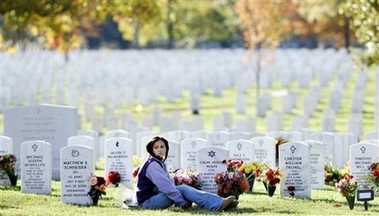 For more than three months, she has come to Arlington National Cemetery to talk to Colin about the minutiae of her life, to kiss his narrow white headstone topped with a Star of David and to stretch out her slim body next to his as if they were lying together again. Kira is no war widow. She is 19, and just barely, at that. The young couple's only talk of marriage had been a joke about their similar last names, hers Wolf and his Wolfe. But they fell in love at once, the kind of reckless, consuming love available only to the young. "The kind of love where your whole world is on fire and you can't stop smiling," she said. "The kind of love where you dance around and you don't feel like you're part of this world anymore." They dated for one perfect month before he shipped out to Iraq with his fellow Marines from Camp Lejeune, North Carolina, in July 2006. The day he left, she gave him a gift -- a camera, and instructions to photograph everything he saw. As he rounded the barracks without so much as a glance behind, she told herself he would be back in seven short months. She could wait. But he came back much sooner, just seven weeks after his departure, his burned remains laid in a flag-draped coffin. 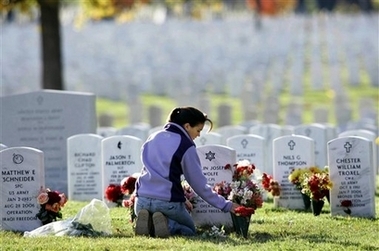 He was buried at Arlington on September 11, 2006, five years to the day that inspired his journey, one of at least 3,000 members of the U.S. military killed in a war that began when he was 16 years old. On September 12, 2006, her 19th birthday, she returned to his grave. She has come every weekend since, and every other day when she's home from college. "When we were apart, all we did was talk about how we could hold each other again when he came back," Kira said, plucking at the grass around his grave. "Now that he's back, we're only a few feet apart and I still can't hold him." Kira was 18 when she locked eyes with 19-year-old Colin Joseph Wolfe in the parking lot of a Wendy's restaurant in Manassas on a humid summer night. "He's so cute," Kira told her friend. They saw little of each other at first, with Colin at Camp Lejeune and Kira at her parents' home in Fairfax County. When they did meet on his weekend trips home, they were all heat and sweetness, two young people enjoying their youth and freedom. When they were apart, they exchanged breathless text messages on their cellphones. "To me, you are perfect," Kira would write. "Ur better," he would respond. They didn't talk much about the future or death, except those stark memories of the September 11, 2001, attacks that had made things click in his mind. He had always planned to join the service, he had told her, motivated by a deep appreciation for the Americans' liberation of the Jews during World War II. The attacks on U.S. soil sealed his resolve, he told her, and he enlisted right after graduating from Osbourn High School, in the summer of '05. On the eve of his departure from Camp Lejeune, Kira joined him in North Carolina to say goodbye. They kept the conversation light and normal, hoping to prolong all the perfection. She told him she'd wait for him. "I told him that seven months wasn't very long at all," she said. After he left, they moved from those flirtatious text messages to the effusive, romantic language of handwritten letters. "Baby I love you so much and miss you so much," he wrote August 11. "Feel better and know I'll always be a ear for you and you can tell me anything you need to good or bad." The fall semester began, but Kira's mind lingered on what it would be like when Colin returned. "Will it be cold? Can I wear heels? I want to look as good as possible," she told herself. "Would I throw my arms around him? Or would I be stuck in place with happiness?" On August 30, as she sat restlessly in class, she wrote a poem about the month Colin was scheduled to return to her. "To miss rough hands, stern eyes so much, They knife the heart with thoughts . . . of sweet February." On the other side of the world, Colin had volunteered for a midday mission in the town of Habbaniya. His Humvee hit a roadside bomb. The blast ignited the gas tank, then the ammunition. He died instantly. When Colin came home, Kira would wear black. Kira called her mother, sobbing and hysterical. Kira's mother and dad, recently separated, went to Radford to get her. Her mom, Valerie Makepeace, began to grasp the depth of her daughter's love for the boy who had been so polite and respectful. They took her to Colin's home in Manassas so she could sleep in his bed that night. It was a pain her mom understood. When she was 27, Makepeace's first husband died in a motorcycle accident, a jarring experience that left her wondering how she would face the many years to come without him. She sees her daughter's trips to the cemetery as healthy, part of a healing process that has only begun. But Makepeace worries about her daughter, about her being frozen forever in a perfect month, one in which Kira and Colin never fought, never argued. "He will always be perfect. They will always be perfect. She will never, ever see a side of Colin that was not perfect," Makepeace said. "And who can compete with perfection?" It is a question that occurs to Colin's family, too. Colin's mother, Amy Wolfe, said she sometimes wishes Kira had been pregnant when Colin left, a little piece of her son alive and growing at home. But no, she said, laughing, he was too good of a kid for that. Now, the family's hope for Kira is that she moves on one day and finds a new love, she said. "As Colin's mother, I don't find anything negative in her going to the cemetery," she said. "But if I were her mother, I would be saying: 'Honey, let it go, move on. You're a young girl, and you have your whole life ahead of you.' But Kira, I don't think she's ready to let go." "To me, it's the most comforting place in the world because it's the closest I can be to him," said Kira, her legs curled beneath her a few feet above where Colin's body lies. On the first pilgrimage to his grave, September 12, she spent three hours there, crying and telling him about how beautiful the service had been. She received a postcard from him that day, too, sent weeks before on the back of a photo of him in fatigues. It was hastily written, she could tell, a note to say he was thinking about her. It also said, "I'm doing alright just really tired." Her recent visits have been shorter, about an hour each, long enough to lay fresh flowers and talk like they did when he was alive. "Normally, I just lie down next to him and tell him about my day, about school," she said, her car keys out of her pocket now, tracing an imaginary line in the grass. "I tell him how his family is doing. And I always tell him he's here with a lot of good men, but he's the best." She has watched his grave grow over, from a flat rectangle of dirt labeled with a plastic marker to a green meadow flanked by marble. 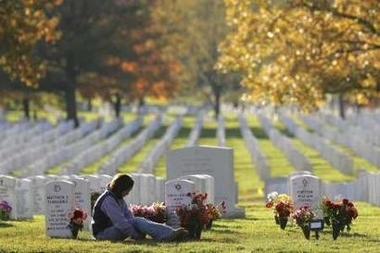 She watched his row of headstones fill out and looked on in sorrow as another row began. There are 29 new graves after Colin's in Section 60, about half so new they lack headstones. 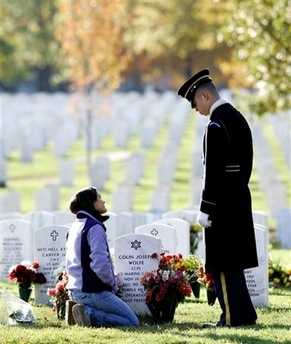 She has met best friends, wives, brothers, parents who come to pay respects to their dead. Some see her and can't help but take her in their arms and hug her. They tell her, simply, "I'm sorry." She has come to know so many of the dead men and women who will surround Colin for eternity -- the one who survived battle but succumbed to a heart defect, the one who took a Darth Vader mask to Iraq -- that she has started laying flowers at their graves, too. She imagines them all together somewhere, Colin among them, swapping stories and throwing back beers. The thought makes her smile. "I think about him all day, every day," she said. "I'm lucky, though, because I don't think a lot of people get to fall in love the way I did. I'm glad I had him, even if it wasn't for very long."